Really old designs I had put high on a shelf, out of sight, out of mind. Unsold earrings from a different time in my life. What a relief to let them go! In some of my “sort” drawers there were things like tiny sterling silver spring rings. Findings purchased ages ago, when silver was $7 an ounce. Like clothing in a closet that hasn’t been worn for years, I was ruthless in ridding myself of things I no longer needed or wanted to find a way to use. The result was 40 ounces of silver scrap and 8 ounces of silver with some gold keum-boo. I also came up with one ounce of gold which included someone’s gold tooth crown (?! ), a gold pin from a boyfriend I dated almost 40 years ago, and have not worn in almost as long, and snips of gold wire and sheet scraps I have saved over the years. I sent them all in to Rio Grande for refining and they will give me 75% of the value in credit. I know how I am going to pay for my next PMC order!! As I get back to work, the snippets, scraps, and rejects will start to gather again in the little dishes around my studio. 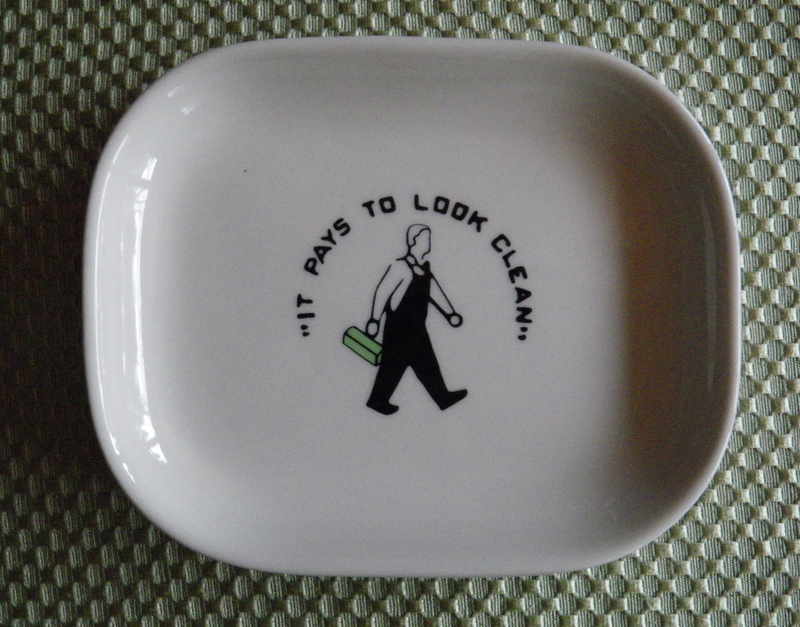 But today, seeing the bare surfaces of these little plates and bowls was a lucrative treat! I love it. That’s like my endless bags of scrap paper. The more I use, the more I accumulate. I don’t think I’ll have to buy paper for the rest of my life…won’t have to but will!! That’s the way it is with beads. I have plenty, but I will always find more to like! WOW! that’s lot of scrap! 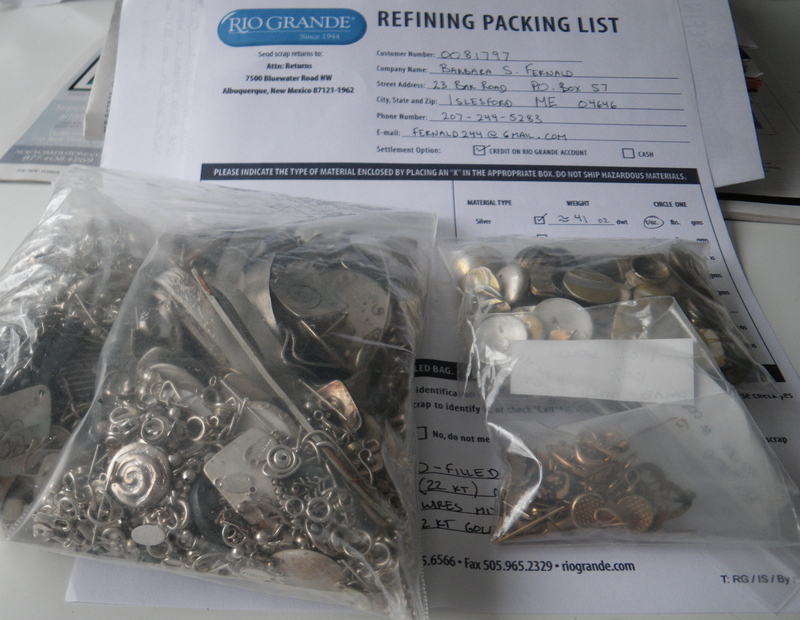 hey, can you mix sterling in with fine silver, in the same bag? Yeah. You can mix sterling and fine in the same bag. And since the price is for fine silver, any of the sterling in there gets weighed as fine. So when you opt for taking a 75% credit from Rio, they are actually paying you about 81% of the value for the sterling. Does that make sense? I’ve sent stuff in twice before, but never did much sorting. 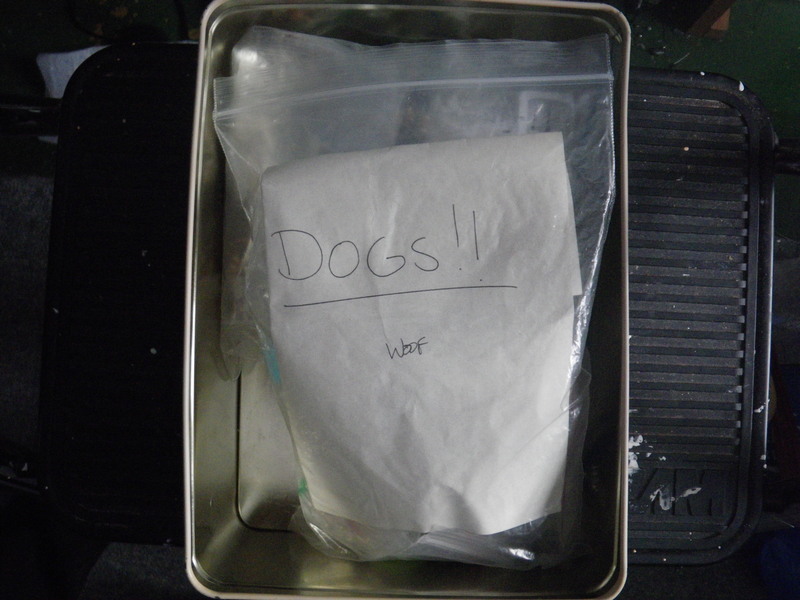 Still got traces of gold credit from the keum boo “dogs!” This time I thought I would see if being a little more particular about how I bagged the scrap, would speed things along. I’ll let you know. The gold tooth was a Bonanza! I’m not telling my mother in case it was once hers….but how did it end up in my studio? that’s what i was wondering, too! it made me laugh!